In partnership with local United Ways and school districts across the state, the Iowa Reading Corps AmeriCorps program launched in the fall of 2013. The program has grown to 71 members serving in 61 Iowa elementary schools during the 2018-19 school year. During 2019-20, we anticipate 75 members will serve in 65 schools across Iowa. Research shows that after third grade, students start reading to learn rather than learning to read. As a local United Way network in Iowa, we are working together to partner with schools and maximize opportunities for communities to access evidence-based reading initiatives that will support the tremendous work of educators in our state. With an overarching goal of ensuring that more Iowa students are on track to read at grade level by the end of the 3rd grade, Iowa Reading Corps is replicating the successful, evidence-based model first launched in Minnesota in 2003. To find more information about the Minnesota Reading Corps and their results, visit minnesotareadingcorps.org. 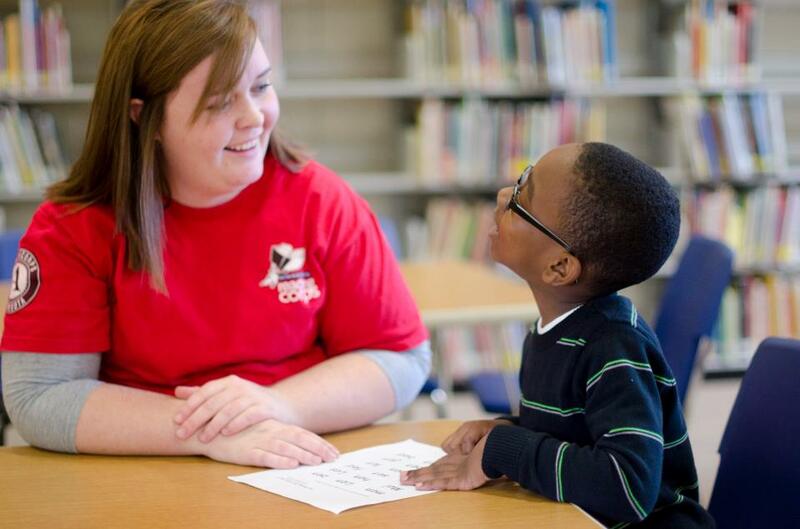 If you're passionate about helping students receive the literacy skills they need to succeed, we invite you to learn more about becoming an AmeriCorps member with Iowa Reading Corps. As a member, you'll provide one-on-one literacy tutoring to students in Kindergarten through third grade who are just below grade level in reading. You'll receive extensive training and support before and throughout your term of AmeriCorps service, so an education degree isn't required to be a successful candidate for Iowa Reading Corps. Are you ready to serve in 2019-20? To apply now, visit: http://bit.ly/2019-20IRCAP_app_link . Iowa Reading Corps is a statewide initiative to help ensure that all Iowa students are on track to read at grade level by the end of 3rd grade. The program places AmeriCorps members, trained as Elementary Literacy Tutors, at sites across Iowa to implement prescribed literacy interventions for students who are just below proficiency in reading. Each day, members meet individually with students to conduct 20-minute tutoring sessions that focus on building students’ skills in phonics, phonemic awareness, and fluency. Based upon current educational research and best practices, the tutoring sessions follow a Response to Intervention (RtI) model. During the summer months, Iowa Reading Corps members partner with their local United Way to provide literacy programming for summer feeding programs, participate in summer tutoring programs, and/or coordinate children's summer reading programs at local libraries. Visit our Facebook page today, and Follow us on Twitter to stay up to date on the statewide initiative. AmeriCorps, often referred to as the “domestic Peace Corps,” is a network of national service programs that engage more than 75,000 Americans each year in intensive service to meet critical needs in the areas of education, public safety, health, and the environment. Created in 1993, AmeriCorps is a program of the Corporation for National and Community Service. Individuals who serve in local AmeriCorps programs, like Iowa Reading Corps, make a commitment to dedicate themselves to service and to strive to make a positive impact in their communities. To learn more about AmeriCorps, visit www.americorps.gov.